The surge comparison test is used to find shorts and insulation weaknesses in coils, windings, electric motors, generators, alternators and transformers. These faults are typically turn to turn, coil to coil, or phase to phase. Other problems found include wrong internal connections, wrong turn counts, and more for DC motors. Weak turn to turn insulation is the start of most winding failures. Because it is the only test that can find weak insulation at elevated voltages, the surge comparison test is important for motor reliability and maintenance programs, for diagnosing problems and for quality control. It is an especially powerful tool in combination with Partial Discharge measurements. Surge tests are done on individual coils, stators, wound rotors and fully assembled motors and generators without the need to turn the rotor. A set of fast rising pulses are passed through the coil or motor (the devise under test – DUT). The voltage of the surge test pulses depends on what voltage the test operator sets, or the standard that is used. The test voltage can range from the peak operating voltage of the DUT to around 3.5 times the operating voltage of the DUT. 2E+1000V where E is the operating RMS voltage of the DUT is most common. The surge pulses produce a decaying wave in the circuit that includes the tester and the DUT (see picture). The wave is compared to the wave from another coil or to the waves from the other motor phases. All are displayed on the screen. The waves will be nearly identical if the coils or windings are identical. If one has a fault or insulation weakness, the wave will have a different frequency from the others and separate from them. The iTIG II testers will calculate the wave differences (%WD), also called %EAR or Error Area Ratio). The pulse to pulse surge test is used in applications where there are normal differences in the surge waves, but when the tolerance for Pass/Fail is unknown such as with certain assembled motors and many concentric wound stators. It is also used when there are no other coils/phases to compare to. Surge comparison tests are most often done at a voltage higher than the peak operating voltage of the DUT and therefore referred to as over-voltage tests. They are not destructive. The main reasons for this are that the test voltage is far below the design voltage of the insulation, and the energy involved in an arc is low. A good analogy is an arc from your finger to a door handle as a result of static electricity. The voltage involved can be in the 12kV to 20kV range, but the energy is low and thus not deadly. An arc in a winding from a surge test has a low energy given by the discharge capacitor in the tester and the voltage applied, and it will not damage the insulation as long as the number of pulses used in the surge comparison test is limited, and the test is done under conditions when over-voltage tests are recommended. The Hi pot test is a test of the dielectric strength of the insulation to ground. It is used to determine if the ground wall can handle an over-voltage situation. An over-voltage is a voltage higher than the peak operating (line to line) voltage of the device under test (DUT). The peak voltage is 1.41 x the RMS voltage. Hipot tests are used for everything from very low voltage devices to high voltage equipment. For medium to high voltage rotating equipment, DC Hipot tests called Step Voltage or Ramp tests are used to see if the start of an insulation breakdown can be detected as the voltage is raised. If a breakdown is starting the test can be terminated before there is an arc. There are two types of Hipot tests, DC Hipot tester and AC Hipot. In addition, AC Hipot comes in different power frequencies from very low frequencies to 50/60Hz. The Electrom iTIG II Winding Analyzer includes the DC Hi pot test and can include automatic Step Voltage and Ramp tests reviewed in the Test Technology section. 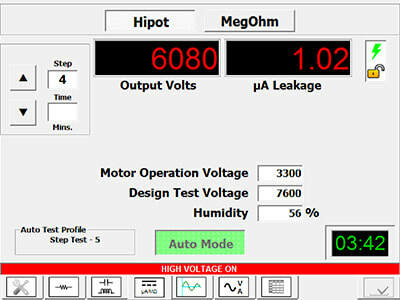 AC hipot can be added to the iTIG II motor tester through a separate unit that is controlled by the iTIG II. A DC over-voltage potential is applied to the windings, and the current to ground is measured in µA with a resolution of 0.01µA. This current includes leakage from the windings as well as other currents such as surface currents on the outside of the windings. For more information on the various leakage currents see Insulation Resistance under the Test Technology section. The test voltage used depends on the condition of the DUT, and typically ranges from about 2E to 3.4E+1700V where E is the RMS operating voltage of the DUT. The over-current trip-out level is exceeded; this level can be set in µA by the user. An arc between the windings and ground is detected. The current to ground is accelerating beyond the rate of change (ROC) level set as a limit for a step voltage test. Can DC Hi pot test be destructive? DC Hipot tests are done at a voltage higher than the operating voltage of the DUT and hence referred to as over-voltage tests. They are not destructive if done properly. The main reason for this is that the test voltage is far below the design voltage of the insulation. Furthermore, the energy available is determined by the voltage applied and the capacitance of the system. This capacitance is relatively low. Should an arc occur because of weak insulation, the relatively low energy involved in the arc will not damage the insulation, unless the test is done under conditions that are not recommended for over-voltage tests. A megohm measurement is used to measure the winding’s Insulation Resistance (IR) to ground. The megohm result indicates how dirty, contaminated or wet the windings are (all referred to as “dirty”). If the megohms are below certain levels, the motor should be scheduled for reconditioning. Typically the lower the megohm number is, the “dirtier” the windings are. PI (Polarization Index) and DA (Dielectric Absorption) are ratios of megohm measurements done at different times. PI is the ratio of the megohms at 10 minutes and 1 minute. DAR is the ratio of the megohms at 1 minute and 30 seconds. PI is most commonly used with form coil machines, and usually includes a megohm time series graph with multiple recorded megohm values. The graph can provide additional information about the condition of the insulation system and indicate if the insulation is brittle or delaminated. DAR and PI results may be tracked over time in maintenance and reliability programs. 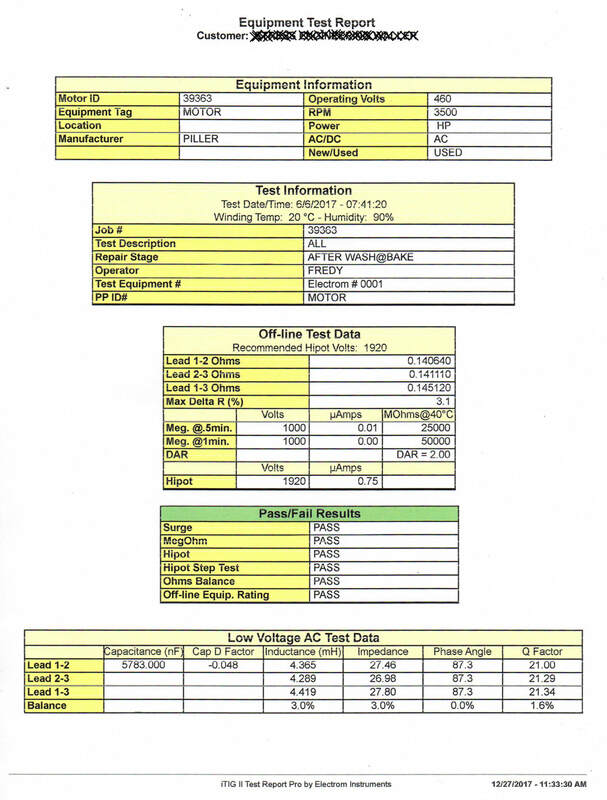 Important: The megohm test results also tell the test operator if the windings can be over-voltage tested with a Hipot and Surge test. Megohm: A voltage potential is applied to the windings. The voltage and resulting current to ground is measured, and the resistance in megohms is calculated using Ohm’s Law. 1,000,000Ω = 1megohm. For a megohm measurement on a used winding, most of the leakage current is often surface currents running in the “dirt” on the outside of the windings. The ground insulation certainly can be weak with conduction current flowing through it to ground. The insulation resistance can be burned or otherwise damaged leading to a low megohm number. There can also be a slowly decaying insulation absorption current. 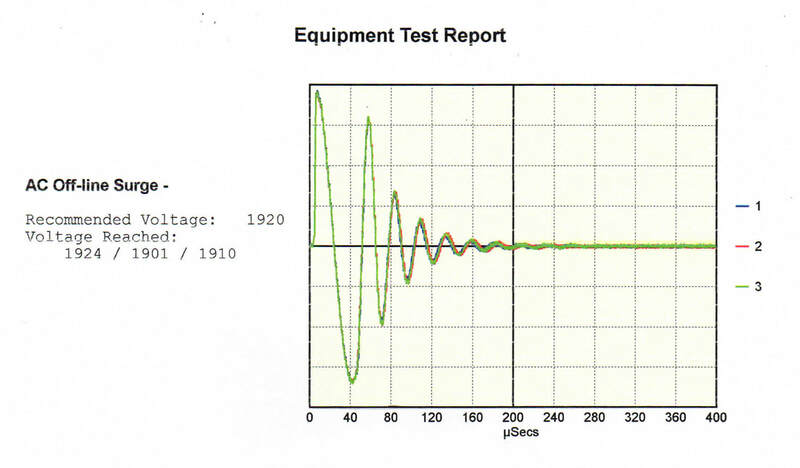 However, in many cases a low megohm test reading is the result of “dirty” windings. Therefore, the insulation resistance or megohm measurement is sometimes referred to as the “dirt test”. PI, Polarization Index: This test is mainly used on form wound motors and generators. 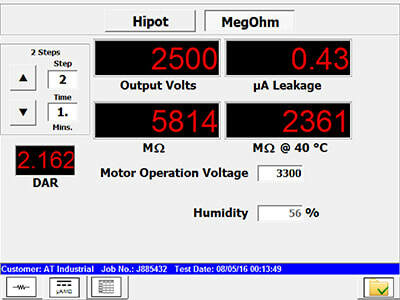 Megohm data is recorded over the 10 minutes, and the resulting graph and PI ratio can provide additional information about the winding insulation resistance as indicated above. The number of recorded data points can be programmed in the iTIG II motor tester. DA or DAR test: Dielectric Absorption Ratio is the ratio of the megohms at 1 minute divided by the megohms at 30 seconds. This test is also called the Alternative PI test in the IEEE 43 standard. It is typically used when the leakage current measured stabilizes within 1 minute. If this happens, the PI test is useless, the ratio becomes 1, and the DAR should be used instead if a ratio test is required or useful. The winding resistance test is used to find open windings, shorts to ground, wrong turn count, wrong wire gauge, resistive connections, round wires in hand that are not connected in a coil, some connection mistakes, the resistance balance between phases, and in some cases shorted turns. Winding resistance is an important measurement because other tests and measurements will not find some of the problems a resistance measurement will find. Some of these are the wire gauge issues, resistive connections, and blown or disconnected magnet wires in hand. Winding resistance tests are a measurement of the applied DC voltage and current to the device under test -DUT. Using Ohm’s law the resistance is calculated in µΩ (micro Ohms) or mΩ (milli Ohms) by the winding analyzer. For a 3-phase motor, 3 resistance measurements are normally done between the phases, and the balance or imbalance between the 3 measurements is calculated and displayed along with the measurement values. For single coils and sometimes for motors, the resistances measured may be compared to a resistance value instead of having a balance calculated. The difference in percent to the target resistance value is then calculated. A temperature correction factor can automatically be applied to correct the measurement to a standard temperature so results can be more accurately tracked over time with the winding analyzer. Resistance can be measured with two leads connected to a DUT. 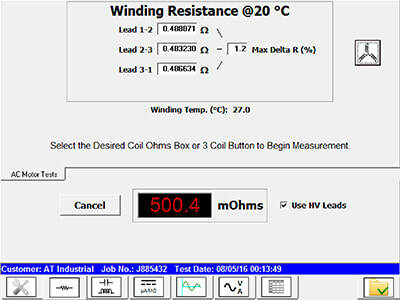 This type of resistance measurement will include the tester’s leads in the winding resistance test’s measurement. A four lead measurement is better. It eliminates the lead resistance and is typically more accurate. All winding resistance measurements done with Electrom Instruments motor testers are done with a four lead system. For the iTIG II Model D the leads are the high voltage output leads so the micro Ohm winding resistance measurement can be part of an automatic sequence of motor tests including high voltage tests. Impedance measurements and components of impedance such as capacitance, inductance and phase angle, are mainly used to calculate the level of balance between the phases in a motor and to compare results over time. Impedance and its components are not published by motor manufacturers, therefore tracking it over time and/or calculating imbalances are required. Assembled motors can have significantly higher imbalances than stators due to rotor influence. Capacitance from the windings to the frame can be used to determine how “dirty” the windings are. This measurement must be tracked over time since good and bad readings vary by motor. Most people will use the IR or megohm measurement for this purpose.Rotor Test, also called a “rotor influence check” or RIC test is used to test squirrel cage rotors for broken rotor bars. Impedance, phase angle, capacitance and inductance are measured by applying an oscillating low voltage to the winding (DUT). The default voltage frequency is 1000Hz, sometimes frequencies around 100Hz can be used. The voltage, current and phase angle differences are measured, and math is used to calculate the various components. Impedance is measured in Ohms. It is different from a winding resistance measurement since this is done with a DC voltage. Since impedance includes components of resistance, inductance and capacitance, it can provide some additional imbalance information when compared to DC resistance only. The D factor and Q factor are calculated. The Dissipation factor is also called Tan Delta. Tan Delta measurements on large machinery typically uses AC hipot type equipment to make the measurement, and should not be compared to this measurement which is a multimeter type. The Quality factor is a measurement of the dampening effect of a circuit. A tuning fork has a very high Q factor, an assembled motor has a very low Q. The Q factor has limited known use when it comes to motor testing. The RIC test uses inductance measurements to plot a sinusoidal wave for each phase of an assembled motor. The rotor is turned between each measurement. Distorted waveforms are indications of rotor bar problems. This test works well on some motors, but not all. DC motor testing is done with the same instrument used for AC motor tests. The tests used are also the same. Since multiple coils and windings are tested, the procedures for doing the tests are different. Multi-coil tests are available. This semi-automatic process makes testing multiple coils and DC armatures fast and easy. 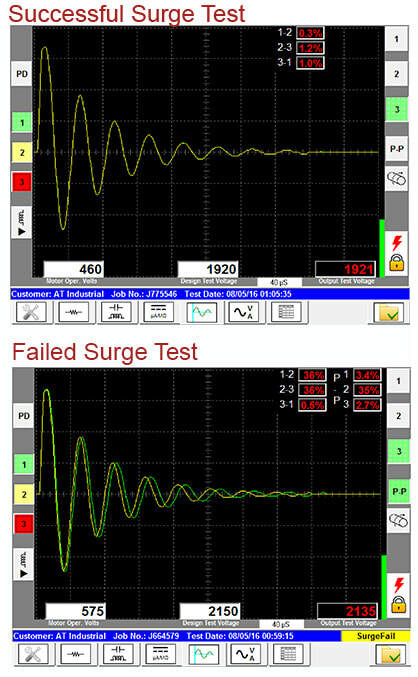 Options for presentation of winding resistance and surge test data include bar graphs. 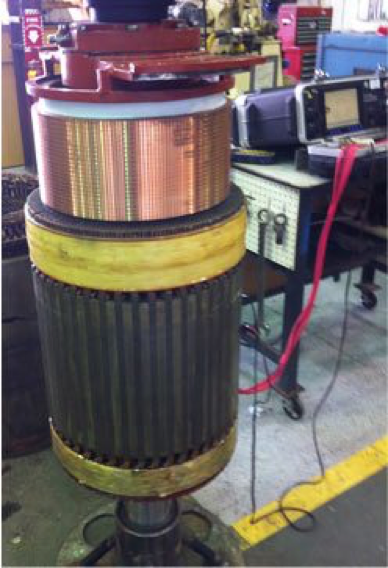 ABT: Surge test bar to bar on armatures, or surge test very low inductance coils. See Test Technologies – Low Inductance Surge Tests. ARP-02: Measures micro ohm resistance bar to bar on armatures. The iTIG II D winding analyzer automatically detects the percentage of equalization which can change the resistance from one measurement to the next. If there is more than one resistance level bar to bar, more than one set of averages will be calculated. For example with 66% equalization, two averages are used. 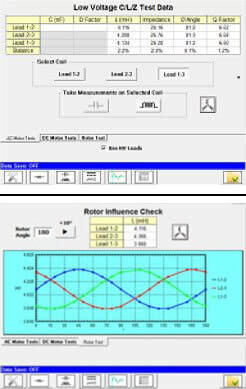 The winding analyzer calculates the percent difference in the resistance for each measurement using the proper average. It calls out any resistance measurement that exceeds the failure limit set.